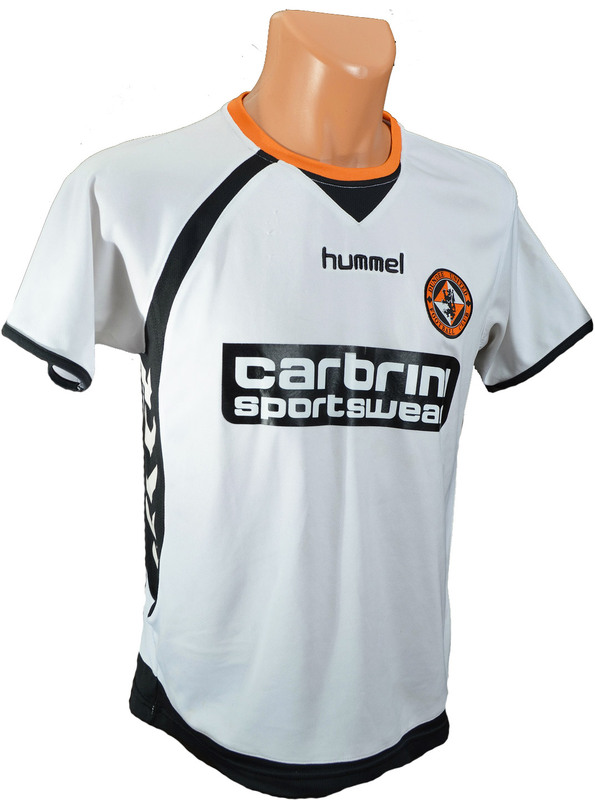 In 2008, United entered their third and final year with kit supplier Hummel. In a break from tradition, Hummel moved their chevrons from the sleeves of the shirt to the side of the kit in curved black under arm panels. The chevrons were white and black, similar to the previous two seasons. 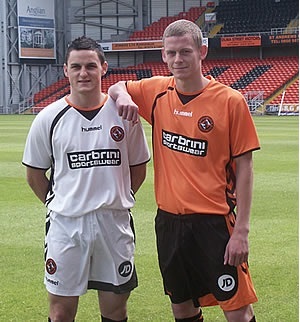 Again the club badge was located on the left side with the Hummel logo central below the black and tangerine trimmed collar. United unveiled their new kit sponsor as Carbrini Sportswear, which was owned by the UK’s leading sports fashion retailer, JD Sports. As part of the deal, JD Sports became the club’s shorts sponsor. In hailing the change, Dundee United Chief Executive Stephen Thompson said, "Our current deal expired at the end of the season and following detailed discussion with several parties, we are delighted to secure an early commitment from JD Sports." The ‘Carbrini Sportswear’ text was white on a rectangular black panel located in the centre of the shirt. The curved black design that framed the under arm chevrons, ran around the circumference at the base of the shirt. Again, the Clydesdale Bank sponsorship was located on both sleeves. On the back of the top was the Fat Sam’s logo and this year the player names and numbers were black with white trim. The numbering also contained the SPL logo. Gomis and Buaben were just a couple of the stand out players to wear this kit. United lost only once in this shirt, a 2-1 defeat at Motherwell in March 2009. This turned out to be the last time this strip made an appearance. One interesting note was that United only used the white kit against Aberdeen and Motherwell. This particular season, they opted for the home outfit when visiting Tynecastle. Throughout the years it has been somewhat of a lottery to determine whether United would wear their home or away kit when taking on Hearts.